Lately, I've been working on some swap cards - the cards needed to use sets from the new Holiday Mini Catalog. 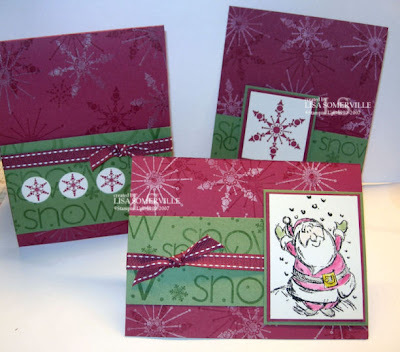 Of course I can't just design one card - so here's a few ideas using the Snow Burst set from the Holiday Mini. The Vanilla Double Technique is from The Technique Junkies Newsletter- 10/05. If you haven't checked out the TJNL yet, you really should, it's full of great techniques and ideas. I've used the same card stock on all of the above cards - Purely Pomegranate, Wild Wasabi and Very Vanilla. All base cards use the Vanilla Double Technique from the TJNL. Other items you'll need are the 3/4" circle punch, Snow Jumbo Wheel (page 7), Jolliest Time of the Year, Purely Pomegranate Double Stitched Ribbon, and the Snow Burst Stamp Set (page 16). I used the following ink -Purely Pomegranate, Wild Wasabi and Vanilla, Black Stazon, Yo Yo Yellow and Going Grey Ink Pads. If you'd like to order these items and recreate these cards, email me today to place your order and get a head start on your Holiday Cards! I love the color combos, these are so cute!!! Another great job, Lisa! Very pretty Lisa! I wasn't sure if I liked pomegranate, but your cards have definitely sold me on it. These are adorable Lisa. More fabulous cards...as usual! oh, my! I wanted that snow burst set, but talked myself out of it. now I see it is a MUST HAVE! wonderful cards! Awesome cards, Lisa. I love all of them!